Happy Birthday to Karl!!! 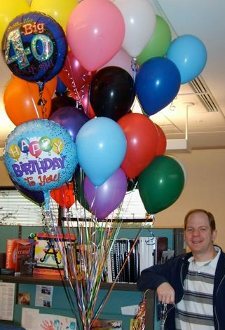 Today he turned 40 and so the fun has already begun (including the 40 balloons at his desk, thanks Mom). Thought you might like to see. Now, back to our normally scheduled newsletter ;-)? We love being a part of Keynote. Last week we heard one of our solo artists, Jimmy Fauntleroy, do his thing and it was great. If you want to check out his music (most of which he writes himself) go to www.littlelordmusic.com. We have had some questions about what exactly our bands/musicians do.? Unlike some Christian artists, they do not play all Christian music.? The goal of our bands is to use good secular music to paint a picture throughout the concert of real heart needs.? They do this through the music and by telling their own stories in between songs in a way that makes sense to the audience. The goal is that the audience would relate to the story. Then when they hear how God loves them and wants to give them a different future than the path they�re on now, just like He did with the band member telling his story, they will want a relationship with God, too. This is also why we have such a wide variety of bands.? Each plays different music and so can reach a different group of people.? From rap to acoustic, we want to �be all things to all men so that by all possible means (we) might save some.� I Cor. 9:22.? Our bands excel in quality, but what matters the most is their hearts.? They share real stories about how God has changed their lives and they pray and trust God to do the work in peoples� hearts. We hope hearing this give you a better picture of the way our people minister so you can pray for them.? They face a lot of obstacles, from tiring travel to spiritual battle, both before and during concerts.? And thanks to God, people�s lives are changed because our artists are willing to go to them.? God bless you! This entry was posted in General on April 15, 2009 by Liesl.